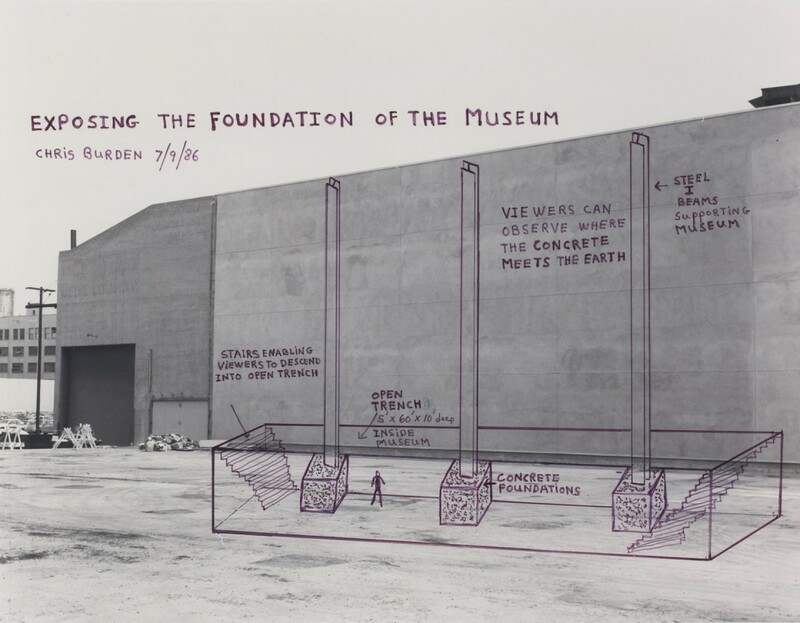 Chris Burden, Exposing the Foundation of the Museum, 1986, marker on black and white photograph, frame (Lt-Med Wood): 15 1/4 x 18 1/8 x 1 3/4 in. (38.74 x 46.04 x 4.45 cm); image: 10 7/8 x 14 in. (27.62 x 35.56 cm). The Museum of Contemporary Art, Los Angeles, gift of Leonard Nimoy and Susan Bay-Nimoy. The Foundation of the Museum: MOCA’s Collection shows the collection as a changing, mutating landscape of developments in contemporary art and curatorial focus as well as the social and cultural backdrops that inform them. Featuring a diverse range of works by artists both long- and newly-associated with the museum—many seen for the first time in years or never before shown—the exhibition reflects a belief that MOCA’s histories and futures have always been multiple, ambitious, precious, and unique.